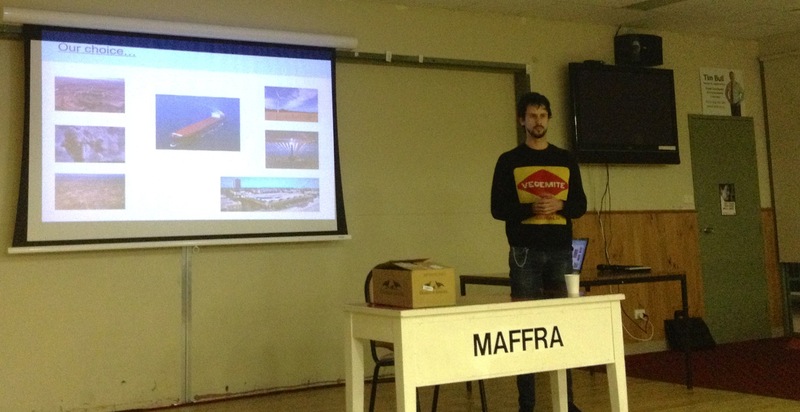 Those opposed to wind energy like to say regional communities are divided on wind farms, so I was unsure how my presentation on community-owned renewable energy would be received. Even though wind energy and was new to many in the audience there was a genuine interest in how the technology could be deployed locally–particularly from the Wellington Shire Councillors present. Gippsland has locked the gate on coal seam gas, and opened it to renewable energy. Several public and commercial buildings as well as ample land makes community-owned solar projects a viable option for Maffra. If the wind resource is rich enough, the community would be able to follow the lead of Hepburn/Daylesford and build their own wind farm. Two or three wind turbines could be enough to meet the electricity needs of the town. Wind energy compared favourably to unconventional gas. With drought-proof income for farmers, generous community funds and rates for the municipality, wind energy has proven economic benefits. When it comes to gas wells, the positive contributions for landowners and local council’s are unknown. If there is a lesson to take away from the experience it’s that context is the key to local decision making on energy. In an attempt to cultivate and tap into the powerful ‘Not In My Back Yard’ (NIMBY) sentiment, anti-wind farm groups narrow the debate to focus the alleged risks to the local community. These range from negative (and spurious) claims about everything from human health to land value. When the debate is narrow and focused on self interest, the anti-wind farm campaigners think they can win the argument. On the other hand, in Maffra, where unconventional gas extraction is a real present threat, wind energy and solar is a much more attractive prospect. Sure communities facing off against gas development don’t want their land despoiled (so you could say there’s a NIMBY element), yet there’s an awareness that is missing in the local debates about wind farms I’ve observed. Community members I spoke with understood the importance of generating energy. They just want it done in a way that is constant with their values. What do people value in Maffra? Productive agricultural land, sustainable aquifers, local self reliance, and the ability to farm into the future. Renewable energy trumps unconventional gas on these measures. Yes 2 Renewables are set for more public presentations in Gippsland over the year ahead. We look forward to broadening the context of the energy discussion and educating people about the potential of clean renewable energy generation at a local level. You are on the right track for our future, Leigh. Thank you so much for speaking at the CSG Free Information night. Wind energy makes perfect sense in Gippsland. Power on.